October 5, 2016 — We at the Manna Food Bank would like to offer the entire town of Bracebridge a hearty thank you for supporting last night’s Fall Food Drive, organized by the Muskoka Oldtimers Hockey Club. It takes a lot of volunteers to run the food drive; 55 drivers and 130 runners, many of them from Monck, Macauley and BPS, covering 43 routes, plus many more who gather at the Bracebridge Fairgrounds to unpack and sort the donated food. 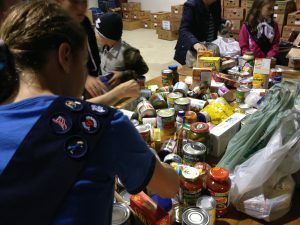 Bracebridge residents dug especially deep this year, giving a record total of 14,500 lbs of food. Cash and cheque donations totalled over $2,400.00. As always, we owe a huge debt of gratitude to the Oldtimers, led by Rob Fraser, for their hard work. The Fall Food Drive is Manna’s only community-wide food drive of the year and it is an essential for keeping Manna going. Most people know about the Fall Food Drive now, thanks to the fact that it has been going for more than two decades, and thanks also to the media outlets, churches and businesses that help spread the word. And speaking of community support; we would also like to send a hearty thank you to Investors Group, which recently organized and donated to a comedy evening that raised more than $1,000 and hundreds pounds of food for Manna. This is becoming a tradition; assisting Manna while raising the community’s spirits, and we truly appreciate it. We are particularly fortunate to have such a cohesive and compassionate community here in Bracebridge. Another reason to be grateful this Thanksgiving.